Oh good, a technical question. Plus an excuse to use a bunch of pics. Question: What are those signs at Gateway that say “Reverser in Neutral” for? First, a little bit of train anatomy. Here is what’s known as the “master controller” (no, not that one), this particular one is in a Type 2. 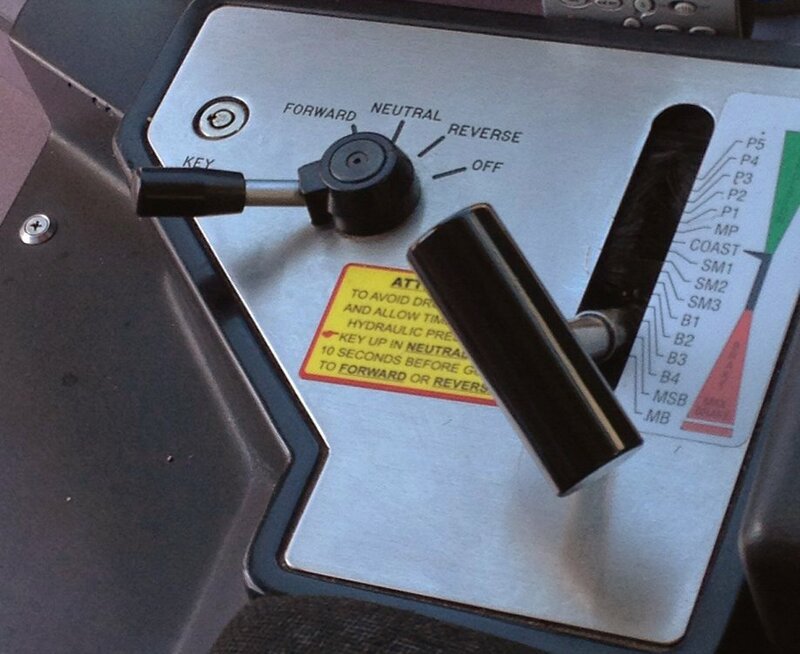 When starting up a train, operators move the reverser handle first into neutral, rather than to forward or reverse. This essentially lets the train boot up properly. 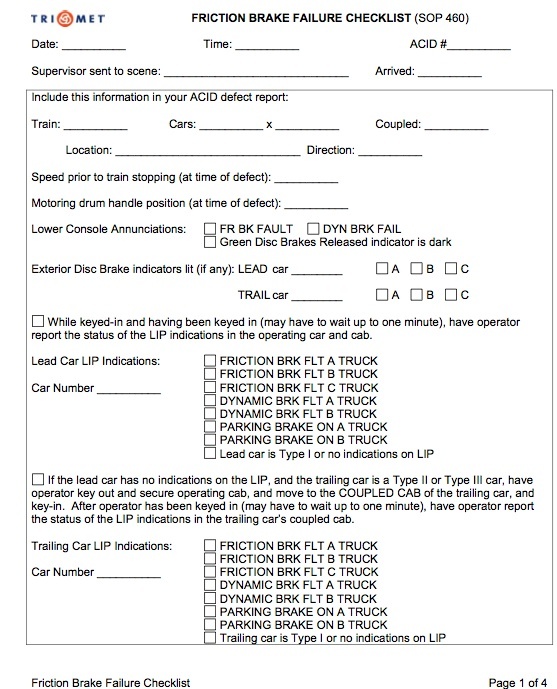 If I understand it correctly (this is getting into more maintenance than operations), there’s also a built-in daily failsafe in the trains that runs a computer check the first time a train is keyed into after midnight, which checks the track brakes and sand, so leaving the train in neutral while it runs this test prevents excessive sand dumping. Anyway, once that’s done, the reverser is used to select the direction of travel. “Forward” is what the public is used to seeing, where the train’s headlights and cyclops (aka railroad light) in the front of the train are lit and the train is moving forward. 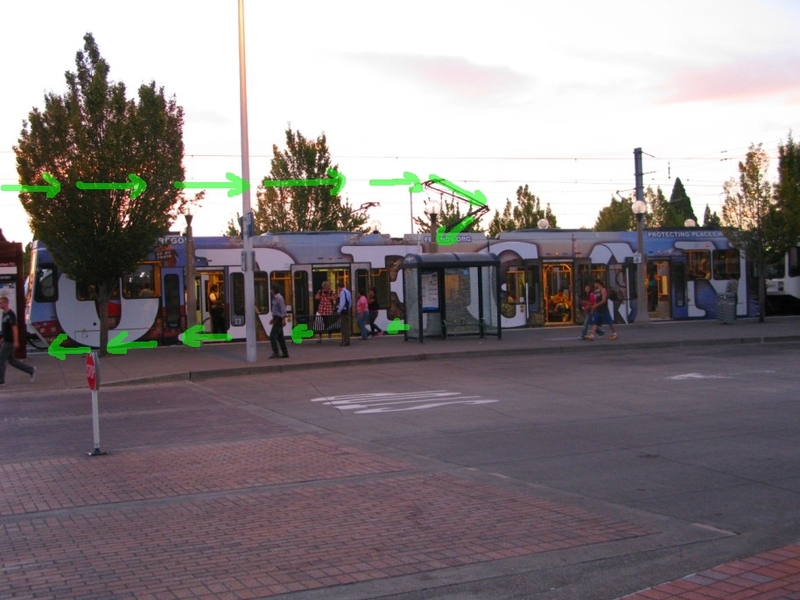 “Reverse” makes the train able to back up, and so this almost never done since you can’t see where you’re going. This is not to be confused with running reverse traffic, where the train is going the “wrong way” down the tracks but with the operator facing the same direction the train is moving. The only time passengers would be likely to see a train backing up is when cars need to be uncoupled on the mainline. When the reverser is in “neutral” you can’t move the train in any direction, but the train still recognizes that cab as the active cab. The headlights & cyclops will go dark, and will be lit again when the reverser is moved to a direction of travel. 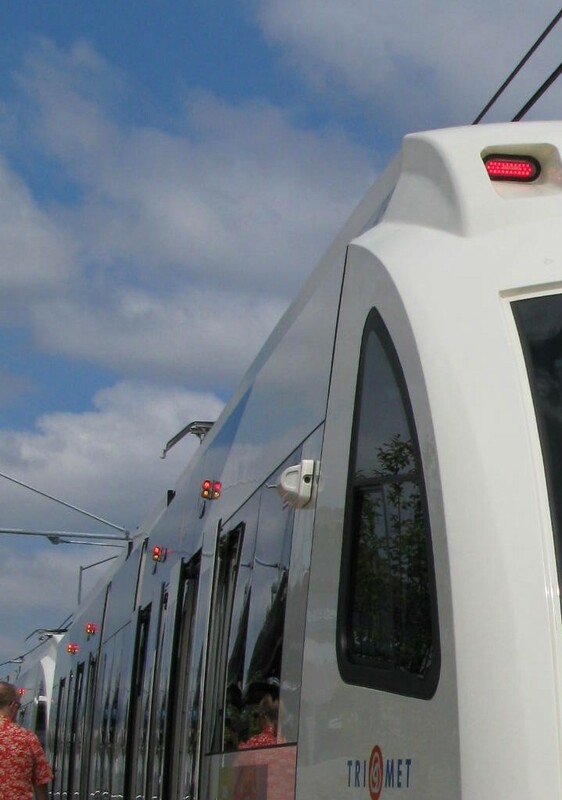 “Off” – turns the train propulsion systems off, but does not affect auxiliary power (this is how an operator can leave the train at the end of the line but the lights, HVACs, and doors will all still have power). Type 4s don’t have an off position; neutral serves the same function. In both directions at Gateway, operators move the reverser into neutral while servicing the platforms. Here’s a westbound red line train coming into the pocket track at Gateway (reverser in forward) and then stopping at the signal to service the platform (reverser in neutral). Putting the reverser into neutral here is a communication to buses. 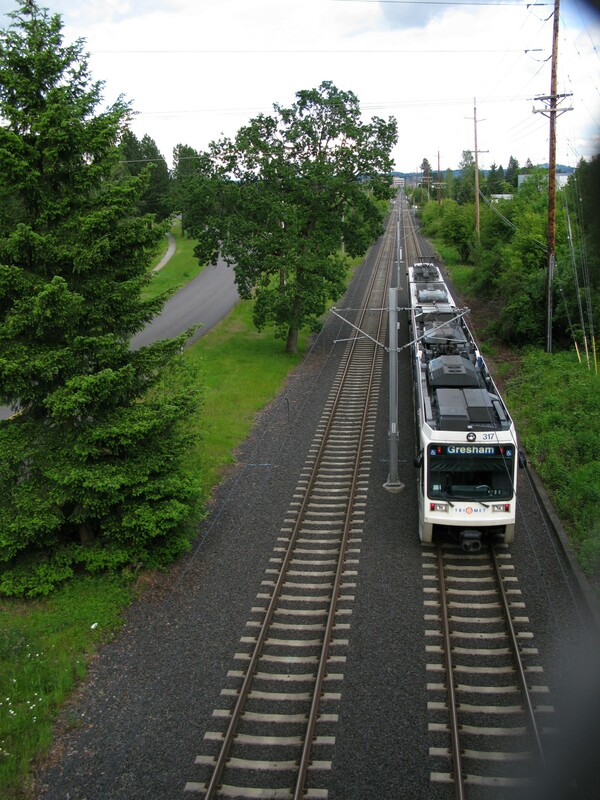 The layout of Gateway has buses crossing the tracks on either end of the platforms, so putting the train in neutral darkens the forward lights and lets buses know that it’s safe to cross. Elsewhere on the alignment, operators will also put trains in neutral to let emergency vehicles pass (as well as funeral processions, but those aren’t as common). Train in neutral at Pioneer Courthouse (not sure why, I’m assuming that an emergency vehicle was passing through). Not related to the reverser, but for those of you looking at the propulsion and braking modes in the second picture and are curious, the range of propulsion acceleration is 0.3 mph/sec in P1 to 3 mph/sec in P5. That would be a very rough start, so trains don’t leave platforms in P5. The braking has the same range of deceleration from B1 through MSB (maximum service brake, the highest level of braking used in normal service). On the bottom is the maximum brake, reserved for emergency stopping as it decelerates at a rate of 3.2 mph/sec. In the middle, MP is the minimal amount of propulsion you can use, coast is neither braking nor propulsion, and SM1-SM3 are similar to a car’s cruise control, designed to hold the train at different maximum speeds without going over. 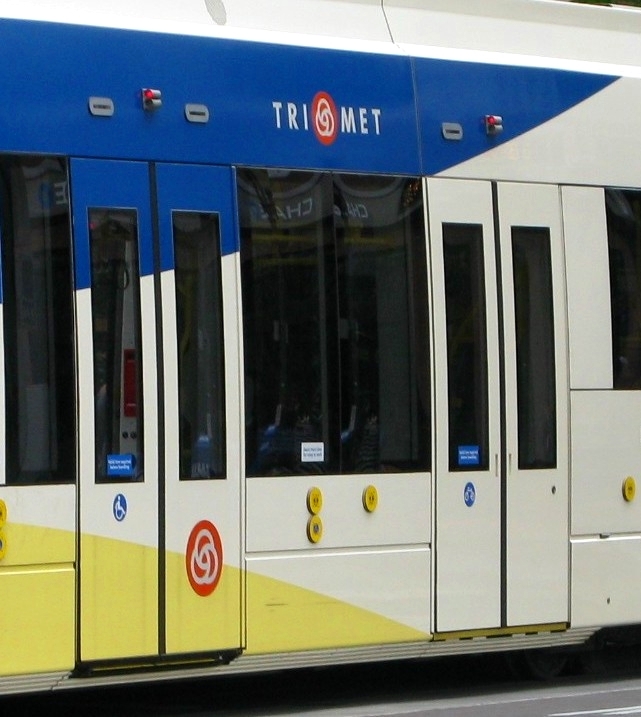 More on light rail braking, which was a surprisingly hot topic – I didn’t realize that dynamic braking on light rail cars would be that interesting in the blogging world, but there we are. Anyway, a belated hello to the people coming over from Reddit. In my last post I mentioned that dynamic braking is the primary method of braking at speeds greater than 3 miles per hour. Slower than 3mph, the dynamic braking blends with the friction brakes. This is because at speeds that slow, the motors-acting-as-generators can’t generate enough power to actually stop the train – remember that dynamic braking works by converting the motion of the train into electricity. Not enough motion = not enough stopping power. So at about 3mph, the friction brakes are applied, and ultimately these stop the train once the dynamic brakes have slowed the train enough. 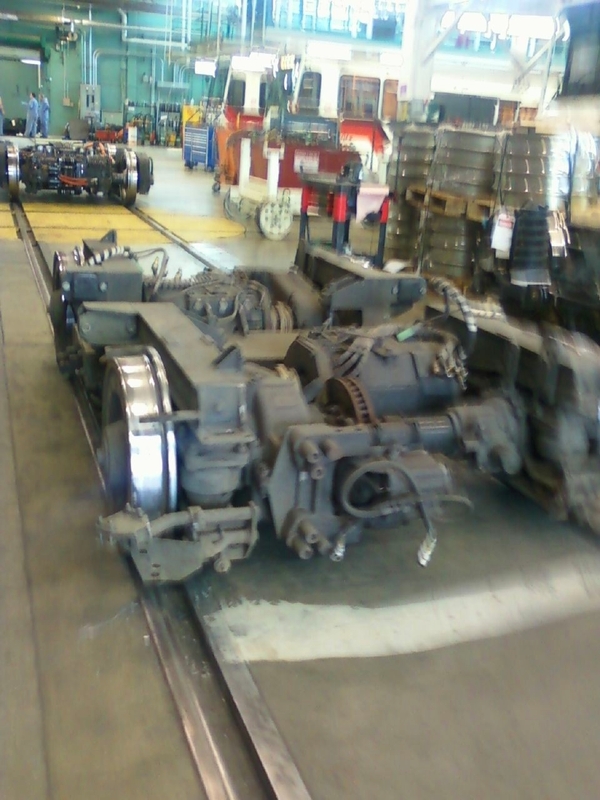 The friction brakes are located underneath the train on the wheel axles. Here is a better un-blurred picture of the friction brakes. 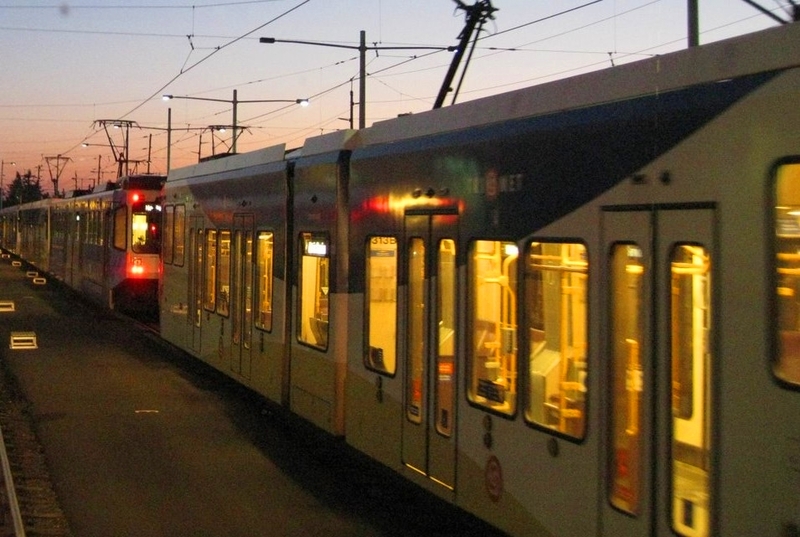 Actually all of the photos in that set are worth looking at if behind-the-scenes train stuff is your thing, and considering that you are presently reading a blog entry about the braking systems of light rail vehicles, it probably is your thing. 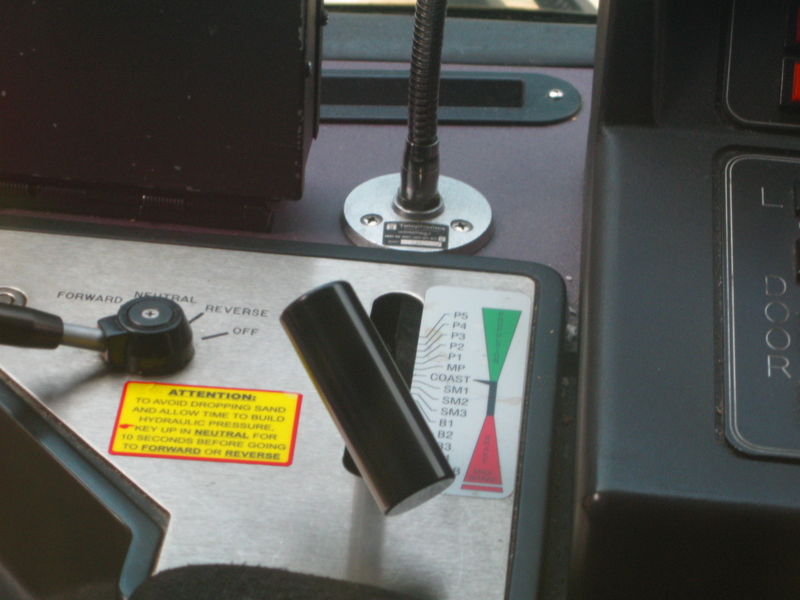 Inside the cab, the operator can tell if the friction brakes are applied or released with this indicator light, found in Types 1-3. It’s lit while the train is in motion above 3mph because the brakes are released. This indicator goes dark only when the brakes are applied. In the Type 4s, a similar indicator is lit only when the brakes are applied, and is dark when the brakes are released. If you’re outside the train or in the cab looking at the mirrors, you can tell when the friction brakes are applied by watching the red brake indicator lights above the wheel trucks (Types 1-3) or over the doors (Type 4). In this animated gif of a train stopping at a platform, you can see the brake light which is above the second passenger window from the door come on as the train almost comes to a stop, then it goes dark again when the brakes are released as the train moves up a bit (probably because the operator stopped on the dead spot) and then back on as the train comes to a final stop to service the platform. On a Type 4, the exterior brake indicator lights are located right above the door open indicator lights – the red light is the brake indicator and the yellow light is the door open indicator. 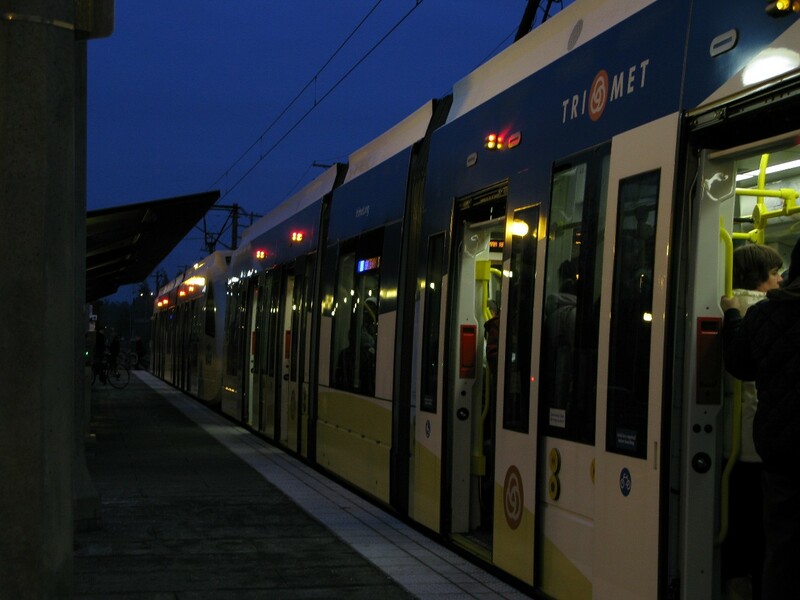 Looking at a stopped Type 4 when the doors are closed, only the brake indicator lights will be lit. 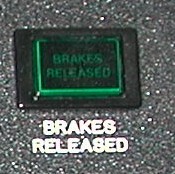 The exterior brake indicator lights will be dark if no operator is keyed in to the train even though the brakes will still be applied. This can be a useful thing for passengers to know – if you’re running to make a stopped train at the end of the line and you don’t know when it leaves, check the brake lights. If they’re dark, the operator hasn’t keyed in in the cab (and might not even be in the train yet) so you still have some time. If they’re lit, the operator is in the cab so the train will be leaving shortly. Friction brakes work on a hydraulic system. Occasionally a friction brake will “hang” and will be stuck applied. 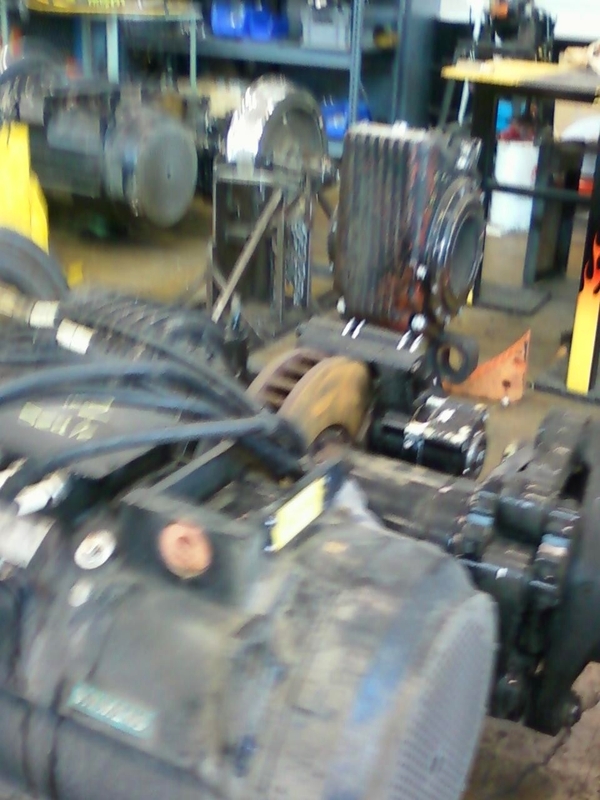 When this happens, the operator can manually release the brake by pumping off the hydraulic fluid. This is what those boxes labeled “MRU” or “brake release unit” inside the trains are for – this is the manual release unit. The whole procedure for releasing a friction brake is very different in the Type 4s – you can see some of it (how the brakes are pumped off) in this video from earlier this year when a Type 4 had mechanical problems at NE 60th. This one I have mentioned before – the track brakes hang between the wheels. The operator applies this to assist in stopping the train, typically on slippery tracks. This is also the brake that will be used in case of emergency during a dead car push. Because it rapidly brings the train to a stop which can be jarring for passengers, it’s not used in normal platform service unless the slippery condition of the rail warrants it. 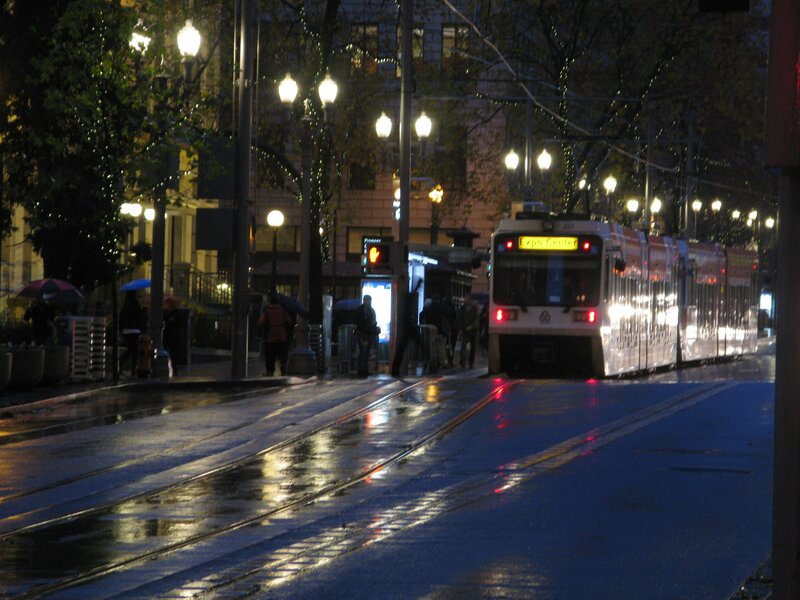 Trivia: From a speed of 55 miles per hour, a MAX train will take about 600 feet to stop. Of course, it’s not going to be a simple answer. 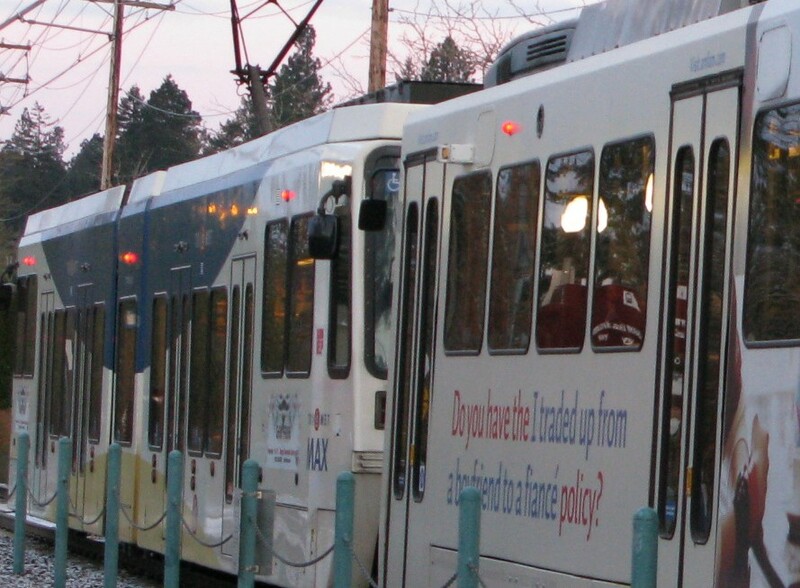 There are several brake systems on the MAX trains. 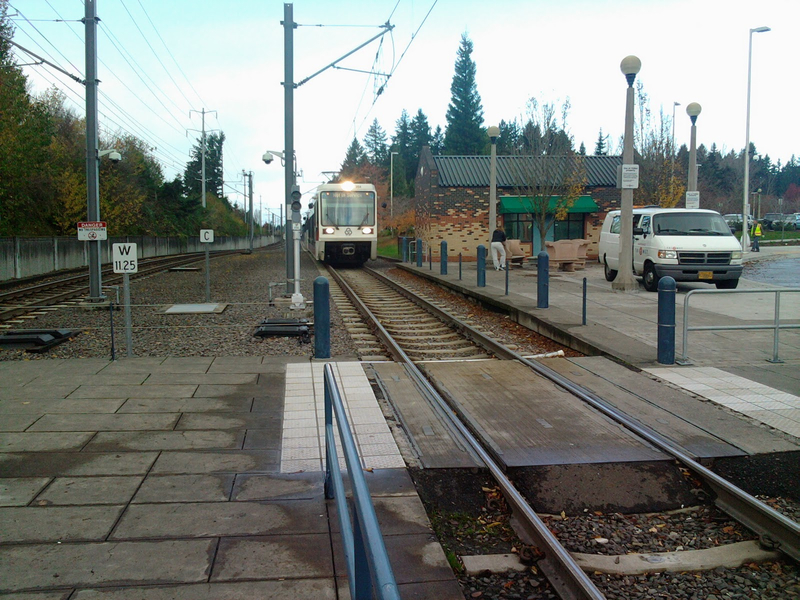 Dynamic braking is the primary method of braking used when the train is going faster than 3mph. 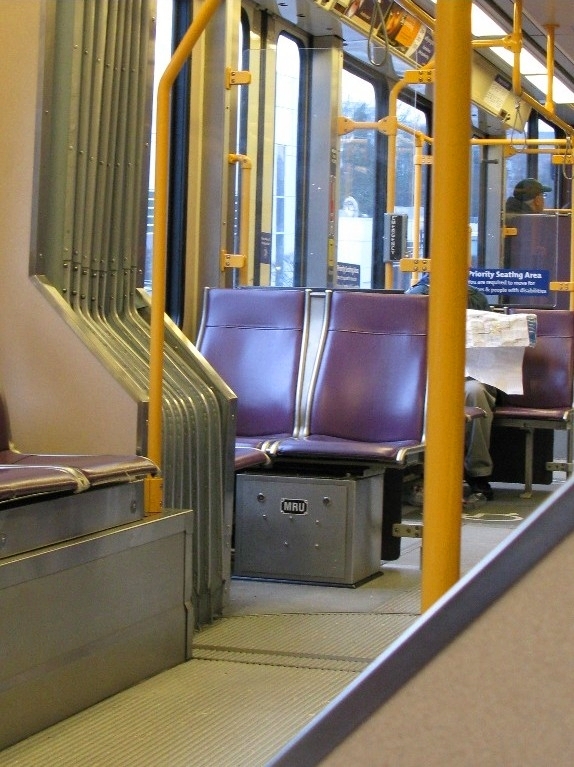 I’ve posted this picture before, but it’s helpful in this context so I’m posting it again – Reverser (on left) and Motoring Drum Handle (on right) of one of the low-floor cars. Click for larger version. On a really, really basic level, you move the train forward by moving the motoring drum handle (MDH) into a propulsion mode, shown in green next to the MDH. 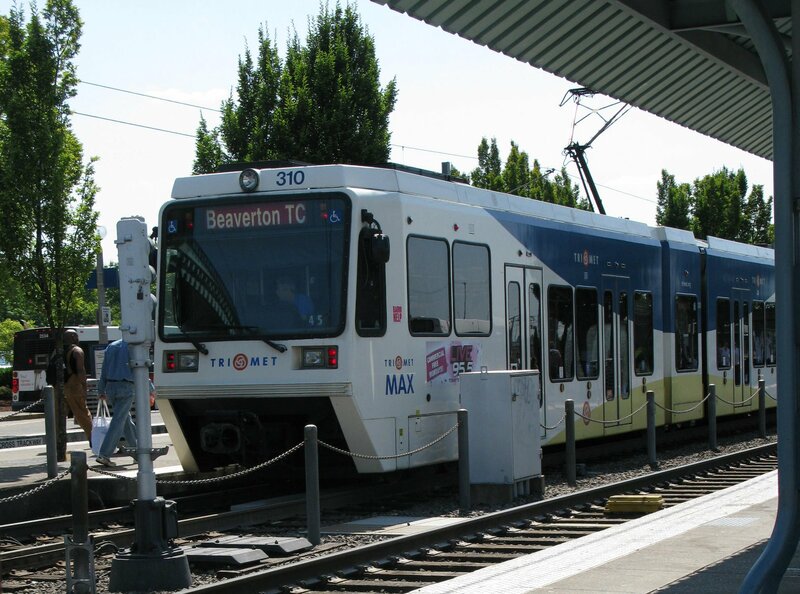 This draws power from a substation through the overhead wires, which rotates the train’s motors and moves the train forward. When you move the MDH into a braking mode (shown in red next to the MDH), that makes the motors stop acting like motors and start acting like generators. The function of a generator is to convert motion into electricity – think of wind or water generators that create electricity from the motion of the wind or water through them. So when the train is in a braking mode and the motors are behaving like generators, they take the forward motion of the train and convert it into electricity. This conversion slows the train down because the creation of electricity happens at the expense of that forward motion. This is a far more effective way to stop a train moving at high speeds than dragging something on the wheels of the train to slow it down would be. But then what happens to that new electricity that was converted from the motion of the train? In the Type 1s, that extra electricity is just given off as heat from the motors. It works, in that the train slows down which was your primary goal of braking, but it’s kind of a waste of that electricity. The Type 2s, 3s, and 4s, however use regenerative braking. I’ve mentioned circuits before in the sense of currents through the rails shunted by the axle of the train wheels. Now think bigger – a circuit going from a substation, along the catenary and down the pantograph to the train, out through the wheels and along the rails back to the substation. When one of those low-floor cars slows down using dynamic braking, that created electricity isn’t just wasted as heat into the air. Those cars channel most of that energy back into that circuit, where another train can use it. Think of it this way the next time you’re in a train braking to stop at a platform – if it’s not a Type 1, the extra electricity from your train slowing down is being sent back into the overhead wire. The next train can pick up that electricty created by your train and use it to propel forward instead of drawing all of its power from the substation. This is much more efficient, because the energy converted from your train isn’t completely wasted, and less power needs to be drawn from the substations when you take power from another train’s braking. This blog discusses how regenerative braking works in detail with helpful diagrams if you are interested in a longer explanation.